At gMedia, we love weddings and receptions! Whether you need audio and video for the ceremony or just need help with the reception entertainment, we have you covered! We've worked with families all across the state to put on the weddings and receptions they've always dreamed of! We count it an honor for you to trust us with one of the most magical days of your lives! 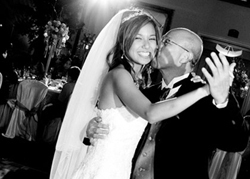 We are partnered with TheKnot and are their featured DJ and Entertainment company for 2014. We are fun, very professional, and are good at what we do. We are competitively priced, but we are not trying to be the cheapest entertainment company. We provide a premium service and are looking for brides who know the value and significance of the choice they make for a company to handle their entertainment. There are almost countless variations and ways to throw a wedding celebration. We can help you plan a traditional wedding, and help you to know what is "typical", or we can help plan any sort of celebration you have dreamt up! It's your day! We can be as involved or as discrete as you need us to be. Don't worry! You aren't expected to know everything, especially if you are planning several months or even a year out. If you can get the information above as close as possible though, it would be very helpful. - Basic Audio System Set-Up with a DJ - This is ideal for the budget wedding or reception. It offers a basic sound system, including two microphones. - Basic Audio System Set-Up with DJ, Video Screen and Projector to display Music Videos, Slideshows, Karaoke, LIVE Texting, etc. - These create a high level of interaction with the crowd. 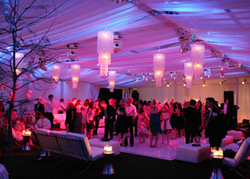 - Basic Audio System Set-Up with DJ, DJ Lighting and Light Show - Lighting creates and element of excitement and movement. 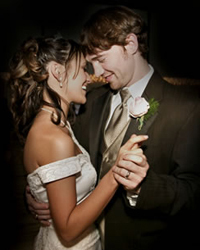 It is ideal to get the crowd moving on the dance floor, as well as creating intimate settings for slow dances, etc. 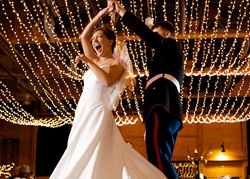 - This package is the ideal for any dream wedding! It is cost effective, and provides the best of everything. Premium Sound System Set-up, Premium Lighting Set-Up, Video and Video Screen Set-Up, etc. This package creates the most excitement. It also let's everyone know that this is no ordinary day! Each package includes 2 hours of entertainment. After you choose your package, options, and any additional hours you'll need us, then you just put down 50% of the total package as a deposit to lock in your day. We still have some dates available for 2014-2015, but do book as soon as possible to secure your day. We take cash, check, or we allow you to pay securely online with a major credit/debit card. No matter what package you choose, we will make sure it is the very best it can be! I know it may be hard to hear coming from an entertainment company, but the DJ and entertainment service you choose can make or break your celebration dreams! We are here to ensure that your dreams come true, and that your family and friends have a great time while making great memories they'll talk about for years to come! We don't want you to "roll the dice" with any other band or entertainment service. This is not our hobby. This is what we do. Your special day is our special day! We are here for any questions or concerns you have along the way. Don't delay! Contact us right now, 24/7.